The frequency of earthquakes has been constant for thousands of years. The number of earthquakes since 1914 is no greater than preceding centuries, and there have been centuries with more earthquake related deaths than in the 1900's. Watchtower information to the contrary raise serious implications regarding the integrity of the Watchtower writers. The following year, Reasoning from the Scriptures repeated this claim. The incredible claim that earthquakes have increased 20 fold since 1914 has been used as an illegitimate way to convince Jehovah's Witnesses we are living in the "last days." This is related to Jesus' statement in Luke 21:11 that there will be "great earthquakes" as a sign of the "end." Being interested in things of a mathematical nature, I was strongly influenced by this comment of a "20 times" increase in earthquakes as irrefutable proof that we are living in the Last Days. I had never thought to doubt this claim by Watchtower, or to verify it through external sources. Without exception, every one of Jehovah’s Witnesses that I have spoken to about this topic is convinced that there has been a significant increase in earthquakes since 1914. Underpinning the very foundation of Watchtower doctrine is the concept that the Last Days started in 1914, and thus Watchtower has gone out of its way to present information that Jesus' signs, such as earthquakes, have dramatically increased since that year. Following the Tsunami of 2004, I chose to research earthquakes from the Encyclopaedia Britannica. This harmless source of information had a profound effect, as it was at total odds to Watchtower statistics. I compared this with information on seismology websites and then corresponded with a seismologist. All sources confirmed that there has been no increase in the number of earthquakes since 1914, either in frequency, magnitude or human death tolls. This convinced me it was time to carefully check every “fact” that I had been taught by Watchtower. This article shows that information presented by Watchtower on earthquakes is grossly inaccurate. Not only did this research bring into question that the Last Days started in 1914; it undermined my trust in everything written by the "Faithful and Discreet Slave." Recognising that millions of followers base their lives on what is served by Watchtower, it is disturbing to review the unethical way statistics are used and experts misquoted. The frequency of earthquakes is bewildering. On average, a great earthquake, one with a magnitude over 8, will occur annually. 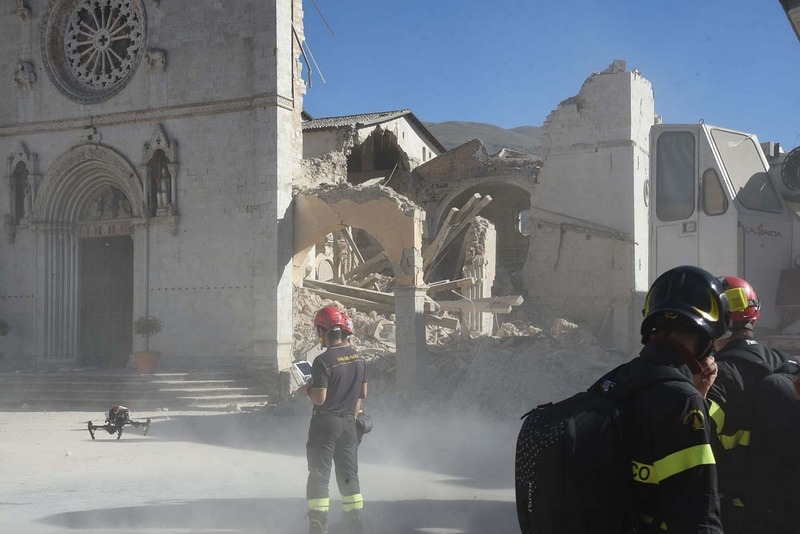 The purpose of this article is to examine whether there have been an increase in "major" or "great" earthquakes since 1914, as stated by Watchtower. A high magnitude earthquake, for instance, as measured at over 8.0 on the Richter scale. An earthquake that results in a human death toll, usually filtered at over 1000 deaths. On both counts, there have been no increase since 1914. The following information details the frequency of earthquakes over time, along with the historical death toll recorded over the last 2000 years. It is accepted amongst seismologists that the number of earthquakes have remained relatively unchanged over many millenniums. A partial explanation may lie in the fact that in the last twenty years, we have definitely had an increase in the number of earthquakes we have been able to locate each year. This is because of the tremendous increase in the number of seismograph stations in the world and the many improvements in global communications. In 1931, there were about 350 stations operating in the world; today, there are more than 4,000 stations and the data now comes in rapidly from these stations by electronic mail, internet and satellite. This increase in the number of stations and the more timely receipt of data has allowed us and other seismological centers to locate earthquakes more rapidly and to locate many small earthquakes which were undetected in earlier years. The reason that the number of earthquakes change little over time is because earthquakes take years to develop, and are the result of the shifting earth's mantle. This is how islands and mountain ranges form, and to create a mountain system can take several million medium size earthquakes over tens of millions of years. As an example of the power of earthquakes, the 1994 earthquake in Northridge, California released energy equivalent to almost 2 billion kilograms of explosive, about 100 times the amount of energy that was released by the atomic bomb that destroyed Hiroshima during World War II. At magnitude 6.7, the Northridge earthquake is considered moderate in size, yet caused over $20 billion in damage. Earthquakes this size occur about 20 times each year worldwide. "There is no significant increase in earthquakes since 1914. The record is better, so people are more aware of earthquakes, more seismometers, better communications, etc. The number of earthquakes varies from year to year, but is pretty constant once the detect ability increase is factored in. The number of earthquakes per year or the amount of energy released on average are expressions of the speed at which internal, gravity driven flows in the mantle act. Very hard to change, and no signs of disruption on any historical timeframe"
Seismology is a new science, with the first seismograph invented in 1880. Accurate records of earthquakes measuring 8.0 on the Richter scale have become possible since then, with complete seismological records now readily obtainable. Whilst the frequency of large earthquakes has not changed, we are now aware of every one, the instant it occurs. The U.S. Geological Survey estimates that great earthquakes over 8.0 occur yearly. Smaller earthquakes, such as magnitude 2 earthquakes, occur several hundred times a day and several million temblors happen every day. For example, in just 7 days to 15th October 2011 there were the following earthquakes between 4 and 6.7. The above image was taken from Google Real-time Earthquakes. This feature is no longer active but a similar live earthquake feed can be seen at quakes.globalincidentmap.com as of September 2015. The following video graphically demonstrates the incredible frequency and constant nature of earthquakes. Dedicated seismologists and researchers, including R. Mallet, J. Milne, P. Verney, S. Duda and A.W. 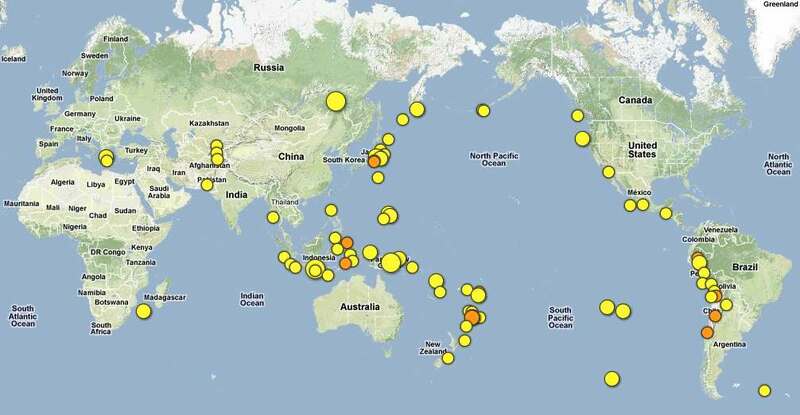 Lee have amassed a considerable volume of data on historical earthquakes. Earthquakes have been recorded as early as 2150 B.C. 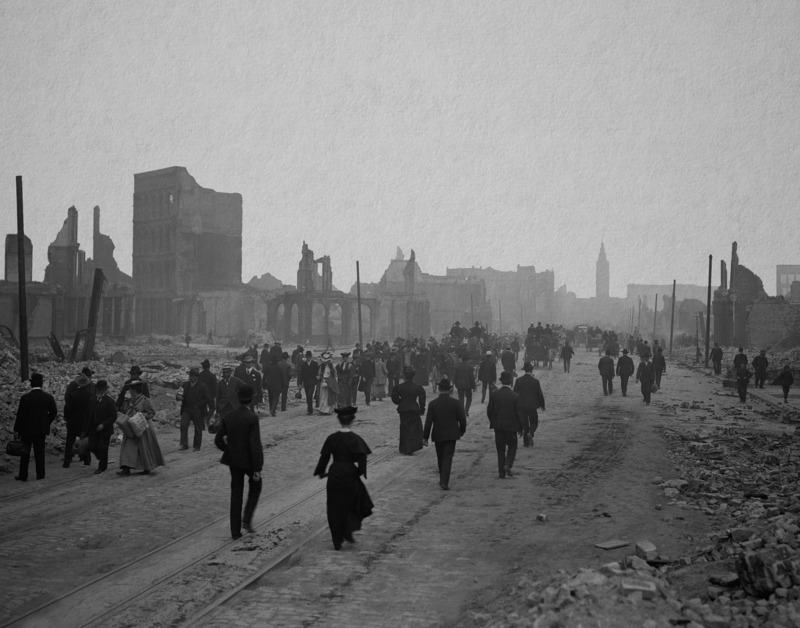 Four magnitude 6.8 or larger earthquakes and many magnitude 6 - 6.5 shocks occurred in the San Francisco Bay region alone during the 75 years between 1836 and 1911. Despite no increase in earthquake size or frequency, one could imagine that the increasing global population would have at least resulted in the most earthquake related deaths occurring in the 20th century. Surprisingly, this has not been the case, with some prior centuries having more earthquake related deaths. A comprehensive source of data used for this article was ntute.ac.uk, which closed July 2011. A list of earthquakes resulting in over 1000 deaths was provided at neic.usgs.gov/neis/eqlists/eqstats.html (July 2005), showing that during the time frame that we have accurate records, there has been little change in the occurrence of earthquakes before and after 1914. 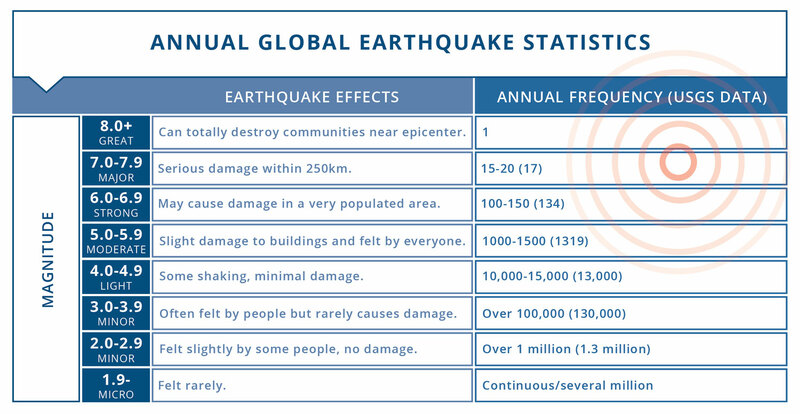 From 1902 to 2001, there were 110 earthquakes resulting in 1000 or more deaths, or 1.1 destructive earthquakes per year. The 12 years prior to 1914, (1902 to 1913) had a higher average of 1.25 per year than the average for the 88 years from 1914 to 2001, where the average drops to 1.08. Watchtower proclaimed "one great quake a year" as more earthquakes than any other period of history. The Encyclopaedia Britannica 2002 on DVD lists major historical earthquakes over the last 1,500 years, in terms of human loss. Of the 5 earthquakes with the most deaths, only 1 was since 1914 and it was by no means the most destructive. The most destructive earthquake was in 1201 in Syria with 1.1 million killed. In 1556, China had an earthquake with 800,000 killed. In comparison, the largest in the 1900's killed a relatively minor 240,000. The total deaths since 1914, as recorded in the full list appearing in the Encyclopaedia Britannica - 2002 ed., was 1.15 million, whilst the same list shows that during the 1200's, 3 earthquakes alone resulted in 1.26 million deaths. Total earthquake related deaths for the 1200's is no doubt even higher than that figure, limited by the lack of records of smaller incidences from that distant time. A comparison of deaths from the 1700's, 1800's and 1900's likewise shows that the number of deaths annually have been very similar, with each of the last 3 centuries suffering over 1 million deaths. Considering the six fold population increase during the 20th century the ratio of deaths to population has been considerably less since 1914. 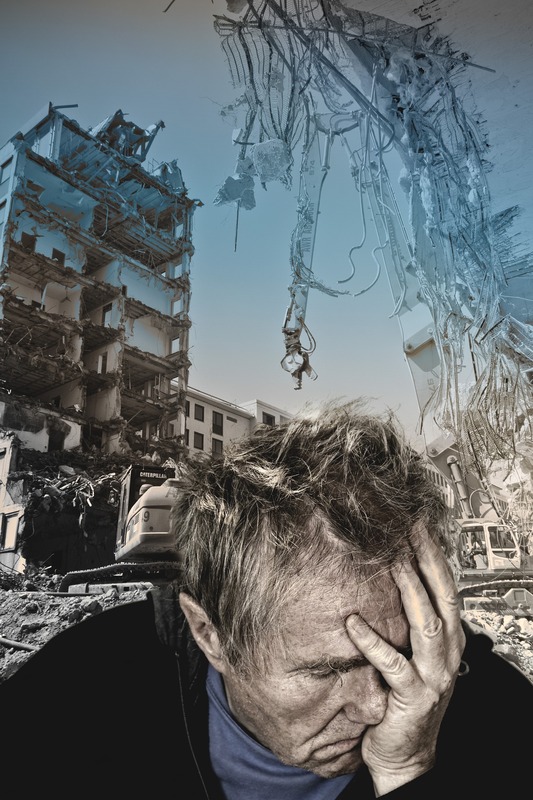 Despite the increased population it appears that improvements in technology - including rescue efforts, building standards and early warning systems - have helped reduce the loss of life and suffering from earthquakes in the 20th century. As explained in the article Why Haiti's quake toll higher than Chile's by Colin Stark, advances in technology mean suffering caused by earthquakes has decreased in developed countries over the last century. "About six weeks ago, a large earthquake devastated Haiti and killed over 200,000 people. Saturday, a huge earthquake releasing 500 times more energy, devastated Chile and killed hundreds. Over millions of years, this tectonic squeezing has formed the Andes and raised the high desert known as the Altiplano. Elsewhere it has created the Alps, the Rockies, the Himalayas, and Tibet. It has also created and distorted some of the islands of the Caribbean, including Haiti. Over its history, Watchtower has regularly made statements and quoted figures to deceptively prove an extremely significant increase in earthquakes since 1914. In light of the readily available information regarding the consistency of earthquakes over thousands of years, it is inconceivable how blatant Watchtower dishonesty is in the following quotes. 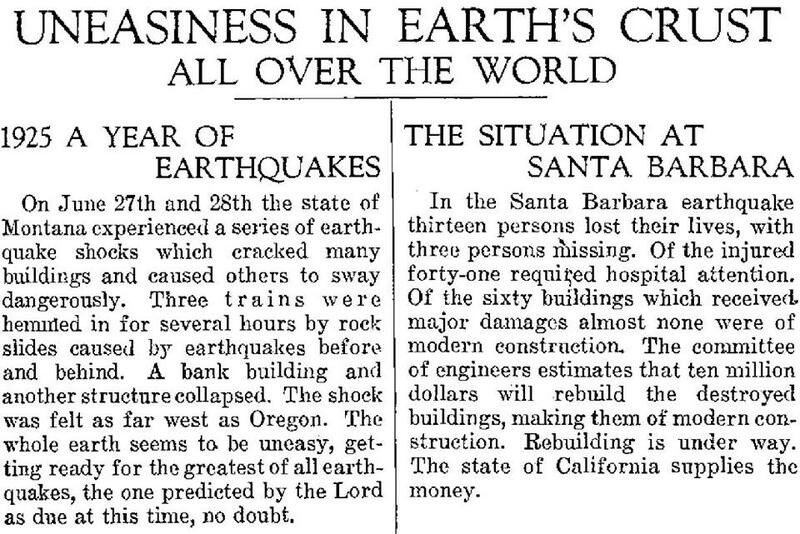 In 1923, the Golden Age Nov 7 page 67 demonstrated not only the inaccuracy and sensationalism of Watchtower comments about earthquakes, but also the superstitious nature of the religion. As supportive evidence that the end was coming in 1925, a spate of earthquakes in the United States were pointed to. In 1984, it was stated that there has been an 11 times increase in earthquakes. Just a year later, Watchtower writers became even more creative, exaggerating the figure up to 20 times. Whilst the English edition of Survival into a New Earth sensationally claimed a 20 times increase, the German edition was changed to the even more outlandish figure of 25 times. The earthquake resulting in the greatest loss of life occurred prior to 1914. It is shocking to see the lack of quality and integrity in information presented on earthquakes by Watchtower. It is noteworthy to examine the way facts and statistics are misrepresented, and sources misquoted, to support the doctrine of increased earthquake activity. 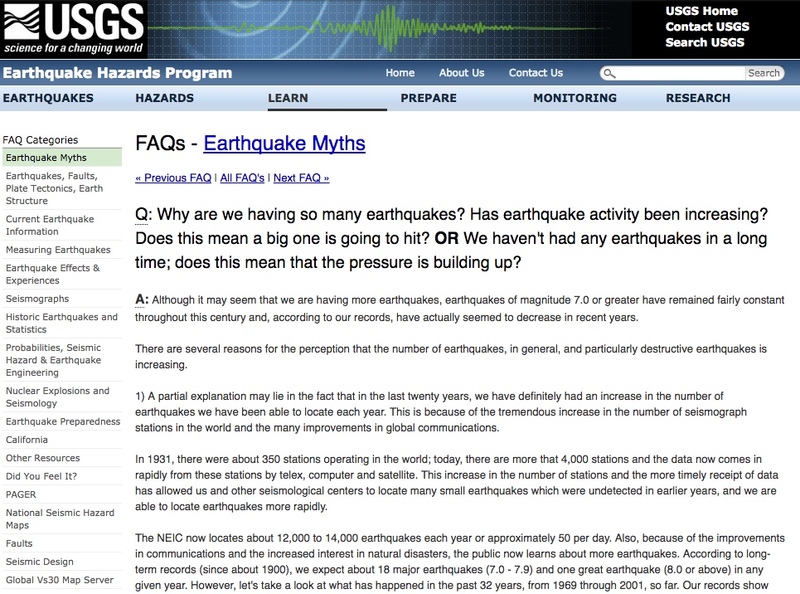 Starting with Rutherford, there has been an ongoing history of false statements about earthquakes. This is an interesting quote, considering that there were actually more earthquakes with over 1000 deaths in the twelve years immediately prior to 1914 than the twelve years following; including large earthquakes in San Francisco, Turkey, Iran, Italy and Jamaica. In 1977, the following spurious statement was made, one which has appeared in numerous Watchtower publications since. The Watchtower writer does not list any source for these figures, and has compiled them to suit their own agenda. It is exceptionally misleading to say there were only 24 earthquakes prior to 1914, particularly when going on to say the 43 since 1914 is only a partial list; obviously the pre-1914 list is the more understated figure. It is quite simple for any person to locate a significant quantity of data to show there were far more than 24 major earthquakes between 856 and 1914. Yet this dishonest information was used a number of times over the following decade. In 1983, the Watchtower included a familiar quote as proof of a rise in earthquakes. "In the Italian journal Il Piccolo, of October 8, 1978, Geo Malagoli observed: "Our generation lives in a dangerous period of high seismic activity, as statistics show. In fact, during a period of 1,059 years (from 856 to 1914) reliable sources list only 24 major earthquakes causing 1,973,000 deaths. However, [in] recent disasters, we find that 1,600,000 persons have died in only 63 years, as a result of 43 earthquakes which occurred from 1915 to 1978. This dramatic increase further goes to emphasize another accepted fact-our generation is an unfortunate one in many ways."" 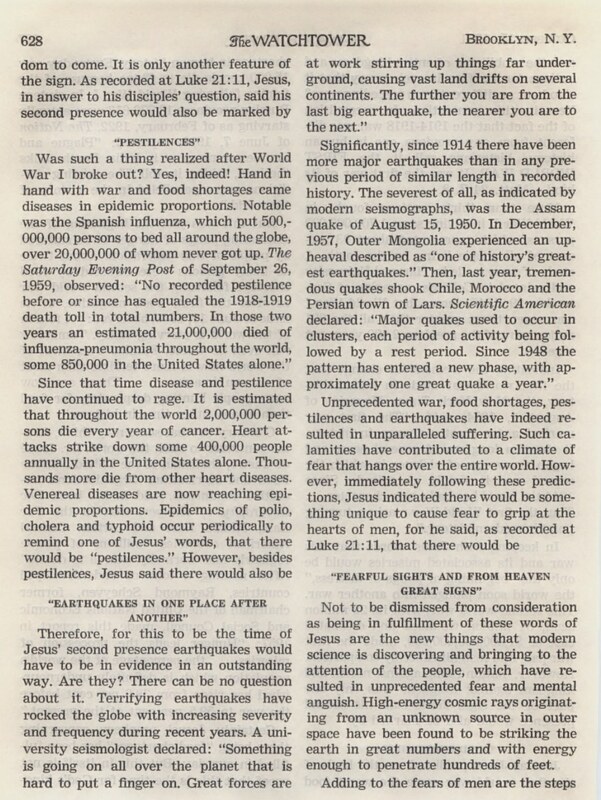 Watchtower 1983 May 15 p.6 Earthquakes - A Sign of the End? You will recognise that Il Piccolo has actually taken its information from the Awake. Since 1983, Watchtower quotes Geo Malagoli, rather than identify itself as the source of this information, such as in the Evolution book. Why not identify itself as the source of Malagoli's figures? To give unfounded credibility to its' own misleading information. 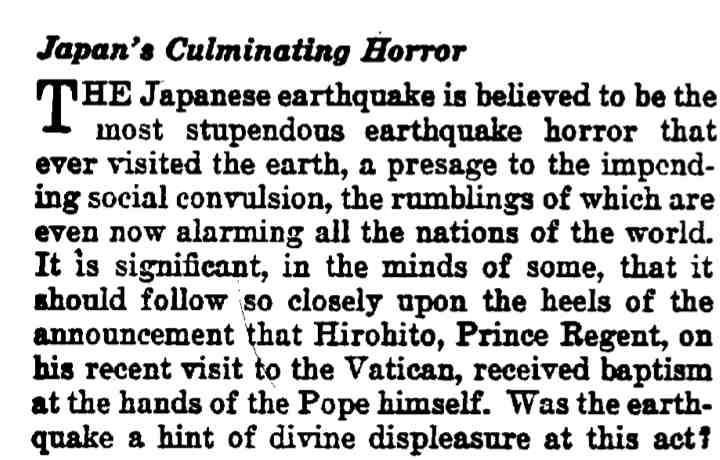 The 1983 Watchtower article also misquotes Professor Aki, in a further attempt to prove a surge in earthquakes. In other words, due to the slow movement of plate tectonics there is no surge, just an apparent one due to better measurement and recording. However the manner in which the Society misquoted the Professor gives the misleading impression that there has been a surge. Whilst ongoing research and data collection on historical earthquakes has increased known earthquakes and fatalities, Watchtower has managed to decrease the fatalities it claims occurred prior to 1914. Statistics from the following magazines show the trend. The box from the Happiness book claims only 1,800 earthquake related deaths occurred per year prior to 1914. Watchtower appears to have created this figure from its own spurious claim of only 24 major earthquakes (1,973,000/1,059=1863). It is generally accepted that tens of millions of people died from earthquakes since Jesus time. In Advancement in Science, June 1969 p.362, J.H. Latter estimates up to 1.5 million people died per century since 1,000 A.D., or around 15,000 per year, a figure very similar to that during the 20th century. The Watchtower publication Insight on the Scriptures goes into great detail about this claimed increase in earthquakes. Damage - $5 million (U.S.) or more in property destroyed"
As has already been shown, it is well attested by seismologists that the number of earthquakes has been consistent for thousands of years, with around 1 earthquakes a year over 8.0 on the Richter scale and 18 over 7.0. Therefore, on this basis alone there were thousands of earthquakes prior to 1914 fitting the first criteria, not just 856. The second criterion was to add any earthquakes that caused $5 million dollars in damage. This hypothetical figure is entirely meaningless for a time period when people had no cars or electricity and generally lived in what we would term a shed by today's standards. How many dollars worth of damage would a camp of Aboriginal humpies sustain in an earthquake? To present these as accurate figures based on the third category is absolute intellectual dishonesty. How can Watchtower expect readers to accept it has a complete list of earthquakes that resulted in 100 or more deaths from 2000 years ago? Over such a long timeframe, most small villages and their records no longer exist. If 100 Australian Aboriginals were killed in an earthquake 500 years ago, who would honestly claim to have any record that earthquake even occurred. Despite this calculation being grossly incorrect, this is the basis for the claim there have been 20 times the number of earthquakes since 1914. Not until 2002, and only after information highlighting the Watchtower's misleading use of figures became readily accessible on the internet, did Watchtower finally concede earthquakes over 7.0 remain constant. These comments still verge on being deceptive for a number of reasons. Firstly, note how it says seismologists state that earthquakes have been quite consistent during the 20th Century. Seismologists state is that it has been fairly constant over thousands or even millions of years. By using the term 20th Century, the impression can still be held by uninformed Witness members that the 20th Century was more prone to earthquakes than those that preceded it. These articles, and the Watchtower in general, try to indicate that the effect on people today is worse than in previous centuries. This is hardly so. In 1737 there was a tsunami in the same area as the Asian Tsunami on December 26, 2004. The 1737 tsunami killed as many people as the 2004 one. Who were more affected, the people in 1737 or those in 2004? In 2004, within hours doctors were flown in with medicine to relieve the pain of the injured, heavy equipment was delivered to help clear the destructive mess and a global campaign of donations means the displaced people could look forward to newly built houses and infrastructure. Compare this to 1737 when hundreds of thousands of people were left to die and fend for themselves, whilst the rest of the world was largely unaware that anything had even happened. A more recent article has toned down comments regarding earthquakes even further. "WHAT IS A COMMON OBJECTION? We are not experiencing more earthquakes; because of modern technology, we are just more aware of them than people were in the past. IS THAT OBJECTION VALID? Consider this fact: The Bible does not emphasize the number of earthquakes during the last days. However, it does say that great earthquakes will occur in one place after another, making them one of the notable features of this momentous period of history. With its statements about an increase in earthquakes proven to be spurious, Watchtower quotes since 2002 show a change in doctrine, recognising that the sign never said there would be a greater number of earthquakes. This is subtle admission that Watchtower had misrepresented the meaning of Jesus words about earthquakes, and then fabricated figures to support its incorrect stance. A doctrine that was a critical foundation stone to my faith, has since disappeared with an inglorious, unacknowledged, whimper. With little effort, it can be determined that the number of "great earthquakes" has occurred consistently for thousands of years. In order to support its apocalyptic view of our times, Watchtower has concocted the idea that the "signs" presented in Matthew and Luke are related to the term "Last Days" written by Peter, Paul and James. As shown at Did the Last Days start 1914?, this entire doctrine is fundamentally wrong. Neither did Jesus or any other Bible writer point to the specific year of 1914 for this to start. The article 1914 shows how the concept that the Last Days specifically started in 1914 is based on misapplication of Daniel 4. Jesus outlined earthquakes as a sign for the destruction of the temple in Jerusalem, but did not detail what constitutes a great earthquake. At Luke 21:11 he is recorded as using the phrase "there will be great earthquakes ", and at Matthew 24:7 simply states there will be "earthquakes in one place after another." Jesus does not say that there needs to be a dramatic increase in earthquakes, and Watchtower statements of an increase are a sensationalist attempt at motivation through fear. Did the Last Days start 1914? shows that Watchtower presents similarly spurious information about the other signs of Jesus. Watchtower information on earthquakes brings into question the honesty and integrity of the Governing Body. 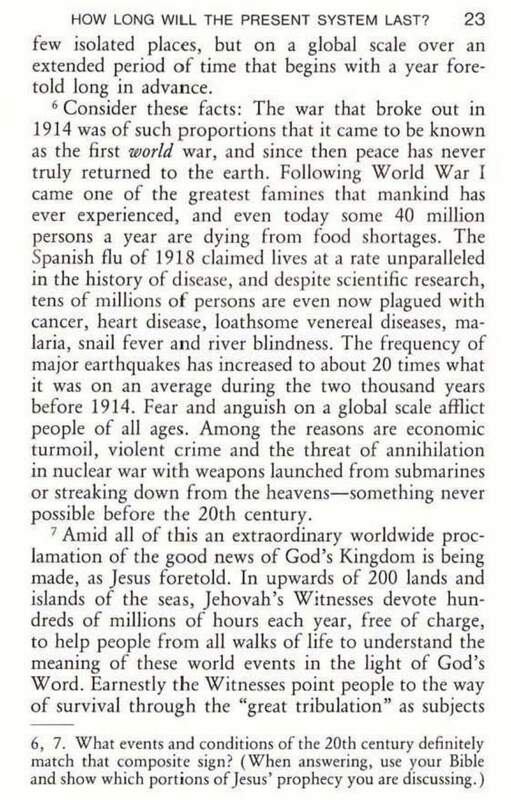 In order for Jehovah's Witnesses to believe earthquakes prove the time of the end commenced in 1914, Watchtower resorts to misquoting seismologists, presenting inaccurate figures, and quoting back their own incorrect information. This type of intellectual dishonesty is not unique to the Watchtower, but common with writers from apocalyptical movements. It is also very effective. After every large earthquake, I receive emails from Jehovah's Witnesses claiming I have been proven wrong and the end is about to occur. There has been no increase in the number of earthquakes since 1914. The number of earthquakes has occurred consistently over long periods of time due to the slow nature of continental drift. Neither has there been an increase in the power of earthquakes. The 1900's did not even have the most earthquake related deaths, nor the largest, nor the most destructive. Despite the above, every time there is an earthquake, Jehovah's Witnesses are triggered to believe it is a sign pointing to Armageddon. Originally published June 2005, last update Jan 2017.